This Saturday (my birthday, BTW), the Belmont Stakes will take place, and after five years, we may have a chance to see another triple crown winner with a magnificent three-year-old colt named Justify. This is so exciting, and I really hope Justify wins! I love watching horse races, because each event happens so quickly, and the horses are so beautiful to watch when they run around the track and cross the finish line. Our modern-day horse races originated from the Civil War, and the first Kentucky Derby was held on May 17, 1875. This was ten years after the war ended. Prior the war, Southerners relished racing their beautiful Thoroughbreds. When the war broke out, cavalrymen still held races for amusement, and placed bets in hopes of making a profit, although they were betting with small items and valueless Confederate currency. Here is an excerpt from my novel, A Beckoning Hellfire, describing one such race. On the morning of April 25, following roll call and breakfast, David saddled Renegade. He and Jake walked over to the wide, emerald field designated as the race course. No one else had arrived, so they said a quick prayer for the safety of horse and rider and for the chance to show the other cavalrymen in Rooney Lee’s brigade just how fast a little horse from the back hills of Alabama could run. Talk of the race had spread from company to company until the entire brigade caught wind of the event, and several other riders expressed interest in racing as well. This didn’t worry David in the least, since he’d been racing Renegade for nearly a year at every opportunity that presented itself in Morgan County. They had always won. He checked Renegade’s legs for heat or swelling. “Tell me again which regiment you’ll be with,” he said to Jake. “You’ll be needin’ somethin’ better to walk in,” David observed, glancing down at Jake’s dusty riding boots. He looked across the field, and David followed his gaze. Men on horseback approached, along with a crowd of soldiers on foot. Two troopers fashioned a finish line constructed of a thin rope at the other end of the field. The crowd grew louder. David and Jake walked toward the commotion. “Are you in the race?” a young soldier in gray asked. The soldier pointed at the starting line, which was also to serve as the finish line. David stepped into the stirrup and mounted. “Good luck, Zeke!” Jake yelled. Removing his slouch hat from his head, he waved it in the air. David grinned. He directed Renegade over to the starting line, took his place on the end, and glanced over at the other six horses. They were all taller and more muscular than his little colt. Their riders turned to sneer and chuckle at him. David touched the brim of his hat in response. Two fiddlers commenced to play “Camptown Races” in harmony. The crowd cheered. At the outburst, some of the horses grew frantic and reared. The officer raised his pistol into the air and fired. Renegade sprang, easily pulling ahead in great stretches, his hooves thundering against the ground in rapid rhythm. David lowered himself close to the horse’s neck. Out of the corner of his eye, he saw two other riders closing in on him. He held Renegade back until he thought they were about three quarters of the way around the track. One of the other riders jeered at him, yelling about how that homely spotted pony couldn’t outrun his steed. David let him pull ahead by a length. The horses grunted with each stride, their hoof beats drumming down upon the turf in quick cadence. The riders whooped and hollered to make their mounts go faster. A couple of the contestants thrashed at their steed’s flanks with sticks. David glanced back over his shoulder. The other five horses were close at his heels. He looked ahead and spoke into Renegade’s ear, using every ounce of love and trust between them to coax the stallion into giving his all. He slapped Renegade with the ends of the reins. The little horse surged forward, ever faster, easily passing the rider in front of him. He pulled far into the lead and galloped toward the crowd of people. David’s heart thumped in his ears with exhilaration as the wind whipped his face. Horse and rider burst through the finish line. The spectators cheered. The six other contestants came in five lengths behind. David eased back on the reins, letting his horse slow to a trot. He walked Renegade back to the finish line where a mass of soldiers swarmed around. “That was some race!” one exclaimed. “I never expected this funny-lookin’ one to win!” said another. David grinned, removed his hat, and brushed his damp hair back from his forehead. He looked around for Jake who was standing near the back of the crowd with his arms folded in front of him, smiling and shaking his head. “Thank you, sir,” David replied. “General Stuart would like to have a word with you.” He pointed to a knoll at the other end of the field. David looked over to see four officers on horseback. “With me?” he asked, awestruck. The colonel smiled and turned his horse. David rode alongside toward the other end of the field. As he neared, he recognized two of the officers immediately. One was General Rooney Lee, whom he had met upon his arrival, and the other was General Stuart, the commanding officer of the Confederate cavalry. David had eagerly anticipated catching a glimpse of the legendary general but had never considered meeting him in person. Riding up onto the knoll, he saluted modestly. The officers returned the gesture. David was astounded by the man before him. General Stuart wore a gray jacket with gold braiding in the configuration of the Austrian knot on his collar and sleeves, a wide yellow sash around his waist, elbow-length gauntlets, dark blue trousers with gold stripes, a red-lined cape, and golden spurs attached to his high riding boots. On his head of curly brown hair perched a wide-brimmed gray felt hat, turned up on one side and clasped with a gilded palmetto star. A black ostrich plume feathered out from behind it. His tanned face was covered with a light brown moustache flowing into a cinnamon-colored beard that reached down to his chest. His bright blue eyes sparkled from beneath the brim of his hat as though laughing at the world and amused with everything in it. “Thank you, sir,” David said. “This is Colonel Von Borcke.” General Stuart motioned toward a large man on his left with a long, blond, curly moustache and short beard. “And this is Major R.C. Price,” he introduced, nodding toward the young man on his right, who didn’t look much older than David. David grinned. “I’d be honored, sir,” he replied. “I assume your horse is sound,” said the general. “You are dismissed,” the general said. David saluted. General Stuart put his gloved hand to his hat and smiled slightly. He released the salute. David turned Renegade toward the base of the knoll. “Congratulations on your victory,” General Stuart called after him. “Thank you, sir!” David called over his shoulder. The crowd had thinned, but Jake waited beside the officer who had fired the starting gun. David looked at Jake quizzically and coaxed Renegade toward his friend. He stared in exhilarated awe at the note that read, “Confederate States of America, one hundred dollars.” Pictures of two soldiers, a woman’s face in profile, and a man he assumed to be a politician were displayed on the front of the scrip. He hadn’t expected to win anything, especially not this much money. His only desire had been to race for the recognition and to rectify Renegade’s bad behavior in front of his company. Glancing back at the knoll, David saw that the officers had gone, and with them, his moment of glory. He sighed, dismounted, and walked alongside Jake back to camp. Many racehorses were used during the Civil War. My new book, Horses in Gray, discusses this topic. At the start of the war, Southern gentry thought that thoroughbreds would outperform other breeds, and thus assure victory for the Confederacy. Southern soldiers brought their steeds with them, and most were nimble, well-bred stock from Virginia and Kentucky. However, it didn’t take long for both armies to figure out that thoroughbreds were too flighty and unpredictable under gunfire, so they switched primarily to Morgans, Percherons, and Saddlebreds, and used various other breeds as well. Thoroughbreds were mostly ridden by commanding officers after that, to give them the appearance of dignity and nobility. General Grant’s horse, Cincinnati, was a descendant of Lexington, a record-breaking thoroughbred. Grant was supposedly offered $10,000 in gold for Cincinnati, but he declined the offer. President Lincoln rode the horse on occasion, and reportedly enjoyed riding him very much. After Grant was elected president, Cincinnati went with him to the White House. General Lee’s horse, Traveller, also had royal racing blood in his veins. His lineage stretched back to English racehorses; from Diomed, to Sir Archy, to Grey Eagle, which was Traveller’s sire. Grey Eagle was a famous, full-blooded thoroughbred, and set many records. 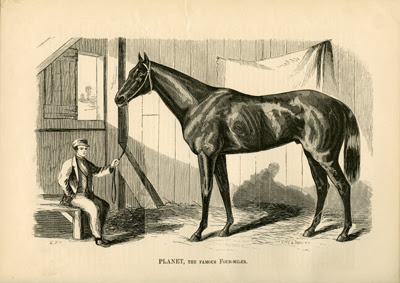 Traveller’s dam was a half-bred grade mare named Flora. After the war, Traveller accompanied Lee to Washington and Lee University in Alexandria, Virginia, where Lee served as president. The general gave rides to the town’s children on Traveller, and everyone could set their timepieces to the punctuality Lee displayed when riding Traveller through town. On this date in 1973, Secretariat won the Kentucky Derby. It was the first of Secretariat’s Triple Crown victories. It should be interesting to see how American Pharoah, last Saturday’s Kentucky Derby winner, does in his two upcoming Triple Crown races. Thoroughbred racing was a very popular sport in this country since its birth, and fortunately, still is today.